There are 2 installation modes, with the two support brackets either on the top or on the bottom. This comes with all the tools necessary for assembly. It's super easy to mount it up by oneself in 15 minutes. 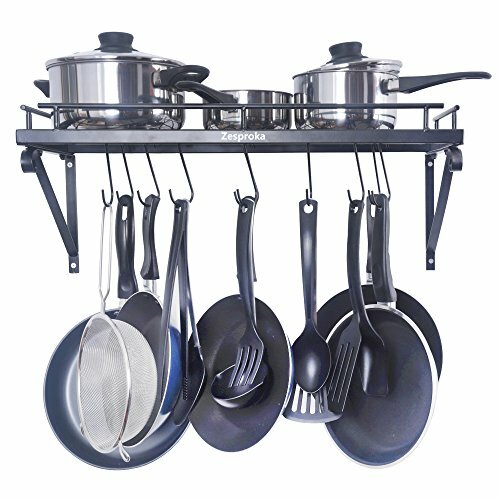 Dimensions of pot rack: 24.5 inches x10inches x 9.9 inches. with 10 S-type hooks. The pot rack is made of thick materials, hand-made welding.. It can withstand a weight of 30-40 lb. It has been specially treated to prevent rusting. There are two installation methods for the pot rack, either method allows you to organize the containers and utensils in the way you want.